Build out of new communications closets with new 84″ data cabinet with APC SU2200 RMXL3U Backups power supply to protect new data communications switching network. Followed through by completing testing, labeling, and documentation of new infrastructure. 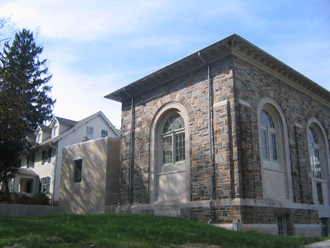 Read more about the $5.3 million Roland Library Project in this article in the Baltimore Sun. Extended fiber optic communication cable from public utility point on Roland Ave. Complete new structured wiring infrastructure to support the following. New Category 6 computer cabling to approx 100 data ports. New Category 6 telephone cabling to approx 40 telephone ports. New CATV RG6 quad shield cabling to approx 10 locations. Complete testing, labeling, and documentation of new infrastructure. Here is a link to a Baltimore Sun article.